Jusuf Nurkic looked like a lost cause in Denver, but he's been rejuvenated in Portland, sparking life into the Blazers and flashing promise once again. The Jusuf Nurkic trade was a low-risk gamble at first. Then it looked like a solid deal. Then, Nurkic kept playing well, everyone remembered the Blazers also received a first–round pick in the deal, and it became a full-on steal. Now, the Blazers have won four straight games and they're within a half-game of the final playoff spot in the West. Against the Sixers on Thursday night, Nurkic had 28 points, 20 rebounds, eight assists, six blocks, and two steals. Blazers fans have hit the "someone knock down that building so we can use the rubble to build a giant Nurkic statue" phase of the trade process. It's beautiful to watch. Nurkic has always had the potential to be a monster. Fran Fraschilla called him a "mountain man" coming into the 2014 draft. He's the son of a 7-foot, 400–pound Bosnian riot cop, and his rebounding and sheer power created buzz the second he set foot in Denver. But he could never find the right footing with the Nuggets. Early on he battled injuries, and when he was finally healthy, he came back to a team that belonged to Nikola Jokic. This wasn't his fault, and it wasn't the team's fault, either. All-Bullseye Team: Who Faces The Most Playoff Pressure? Denver tried its best to play Nurkic and Jokic together. It just never clicked. Jokic was clearly the better player, and after another failed experiment to begin the year—Nurkic started, with Jokic coming off the bench—the Nuggets stopped complicating things. Jokic would start, Nurkic would sit, and the team took off from there. Nurkic was left to wait for a trade. Most people in Denver knew he was talented, but people begin to question his effort and conditioning, and he spent most of this season going through the motions. This is probably why the Nuggets had to give him away before the trade deadline. In a league that's getting smaller and faster every year, not many teams needed an inefficient low-post scorer who can't stay in shape and doesn't always play hard. Now ... Nurkic is averaging 16 points, nine rebounds, four assists, and two blocks in Portland, and he's a better fit than anyone could have imagined. In addition to post-ups, he's setting massive screens for Damian Lillard and CJ McCollum, and he's crashing into the lane for lay-ups and quick putbacks off the boards. It's like pairing a sledge hammer with a buzzsaw. He's also been a better passer than expected, expertly threading the needle to Lillard and McCollum on cuts to the rim. Meanwhile, theoretical rim protection in Denver has turned into actual blocked shots in Portland. His -11.5 on/off number in Denver has turned into +13.7 for the Blazers. If you think that preposterous Sixers statline comes with an asterisk—he was working against Richaun Holmes and Jahlil Okafor all night—it should be noted that he did similar things to Steven Adams and the Thunder in a win last week: 18 points, 12 rebounds, six assists, five blocks, and two steals. "It's not hard when I get a chance like this," Nurkic on the court after Thursday's Sixers game. "I'm here, I feel home, I love it. I just played minutes for the first time in my life, so I'm cool. I just want to have fun and win the games." It won't be like this forever. We're in the middle of a very small sample size. 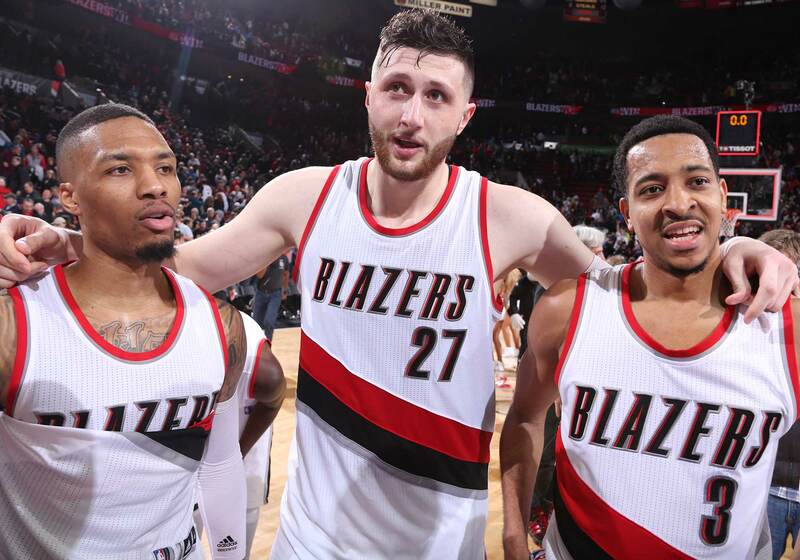 At some point Nurkic will look human, Portland fans will realize there are other changes needed across the roster, and nightly celebrations of the great Blazers/Nuggets trade of February 2017 will begin to fade. That's not the point, though. Right now we're in the sweet spot. There are no expectations, each Nurkic breakout game is treated like a new miracle, and anything seems possible. For both Nurkic and the Blazers, and any basketball fan who's been watching them, the whole season feels different. What's great about Nurkic's second life is that most players don't get one. His story in Denver—injuries, lack of playing time, predictable bad habits—is the most common way that most talented players watch their whole careers get derailed. Things just never click, they never find the right situation, and the league moves on to someone else. Most of the NBA community had already made that shift with Nurkic until the past few weeks. Then the Blazers won four straight, and the playoffs became realistic again. More importantly, playoffs or no playoffs, this is a team that needed a competent big man more than anyone in the league. An expensive off–season full of bad ideas had taken one of the NBA's greatest League Pass teams and turned them into a stressful mess. In the middle of December, I wrote a column lobbying them to trade for Nerlens Noel. They needed something to change the equation. The Blazers didn't trade for Noel, but they might have a solution regardless. He is a giant Bosnian solution with power and defense and surprising passing, who's still only 22 years old. Every night the future looks a little more promising.